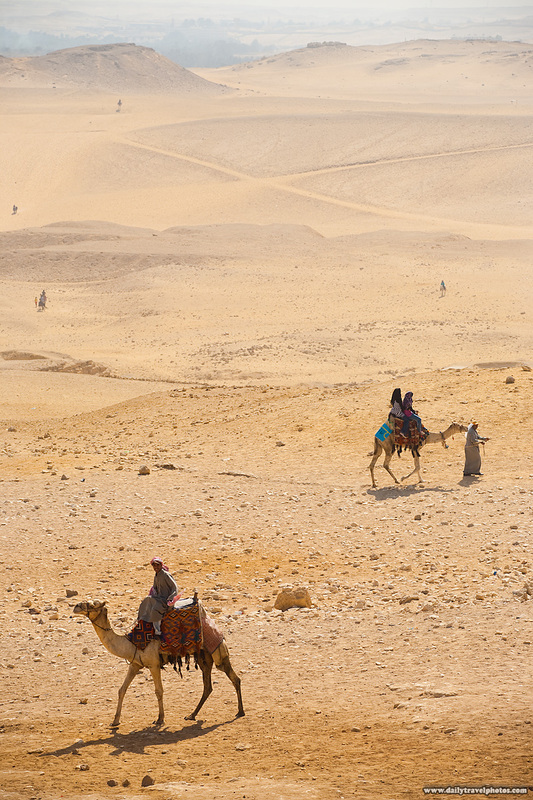 Tourists wander the desert around the pyramids of Giza. The distances are vast around the necropolis, especially to get to the officially sanctioned pyramid viewpoint area clear on the far side of the pyramids. The weather was relatively mild on this day but I can understand the need to ride a camel in the hot desert climate... add the novelty of riding a camel among the pyramids and you'll see why it seems 9 out of 10 tourists are being uncomfortably jostled about atop the humps of these mild-mannered beasts. A user-controlled panorama from near the Sphinx and Giza pyramids entrance. Another shock when I first arrived at the pyramids was how closely the necropolis was situated to the edge of bustling Cairo. It turns out, most of Egypt is desert and the small area on either side of the Nile are the main inhabited areas throughout the entire country. From right to left, you have the Pyramid of Khufu (or Cheops in Greek also known as the Great Pyramid), then Khufu's son's creation, the Pyramid of Khafre, then the Pyramid of Menkaure with its three small Pyramids of the Queens. Fantastic foreground with the trails leading to the camels in the distance. Beautiful artwork.